Nick Hornby used to write a monthly column for the Believer magazine, where he would list books purchased, books read, and various notes and observations on that month’s reading. All those columns, by the way, are now available in one volume, Ten Years In the Tub. They are funny and very honest about the author’s reading habits. One quick look at books bought and books read lists will tell you that those two are usually drastically different. I personally know (maybe) one person who reads books bought right away. To me, this seems amazing. I never do that. 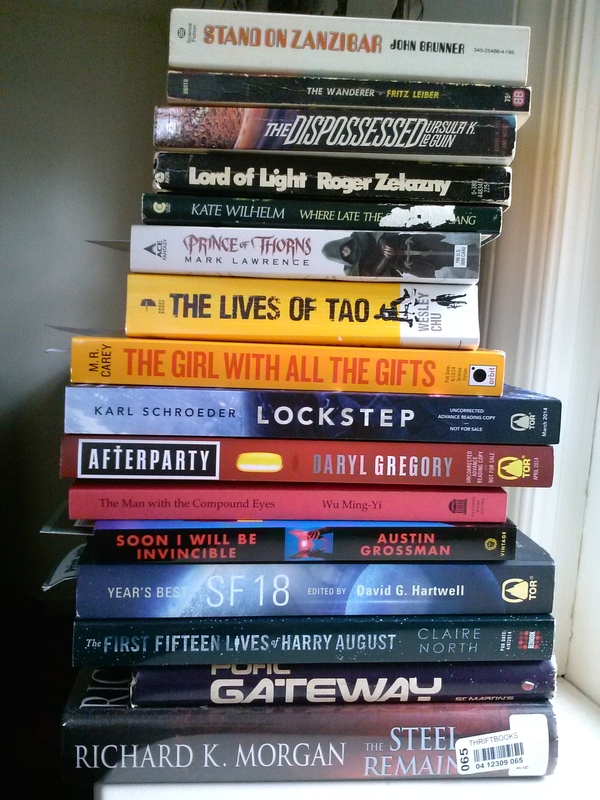 I mean, if I read everything I brought home immediately, I would have never created this Mt. Everest of advanced copies of stuff that is already out in paperback. Anyway, below are the results of this month’s reading efforts. These are divided into two categories: books borrowed (i.e. the ones I don’t get to keep), and books bought/received as gifts/wheedled out of gullible sales reps/etc (i.e. the ones I get to keep). If you think I only took 5 books out of the library this month, rest assured that this is not a complete stack. I excluded obscure non-fiction, depressing Scandinavian literature, odd Japanese literature, and other areas of my reading interest. I will be happy to include those in the future posts if you would like to see them. It’s leaning ever so slightly, threatening to collapse and kill me as I walk by. This actually does not look so bad, and that’s because it doesn’t include non-speculative books that also somehow ended up in my house. As is usually the case, the borrowed books got a quicker read than the ones bought. Reading of borrowed stuff is largely motivated by the fact that I have to return these volumes to avoid being chased by angry librarians and to allow some other person to have their history knowledge tested by something like Hild. Unsurprisingly, I almost entirely failed to read from the bought pile, with Chu being the obvious exception. Well, there is always next month. So, thoughts? Anything from my to-read stacks that I shouldn’t have put off till next month? Anything on my list you’ve read or want to read?